PAM 438 is the first Luminor Marina model in full ceramica. 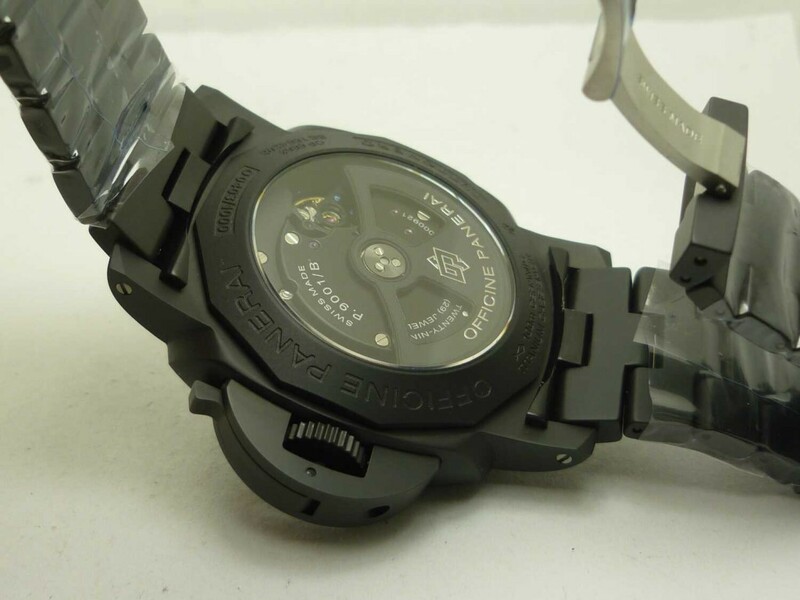 It has ceramic case and bracelet in whole black tone. 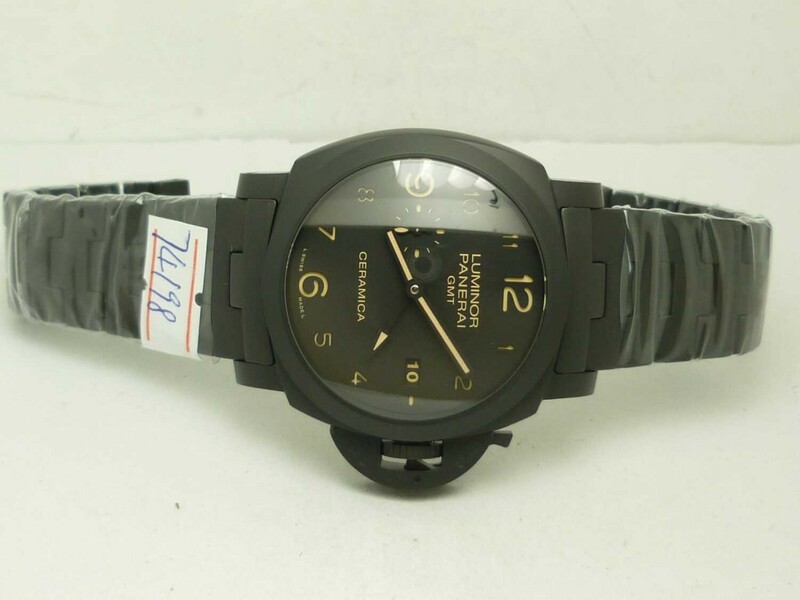 The following watch is going to be reviewed is the replica version of Panerai PAM 438. It is the best PAM 438 replica model that has ever been made. I have several pieces of large watches in diving or military style, but none of them like Panerai featuring such an unique crown bridge that will look tough on wrist. So I bought this one several weeks ago. 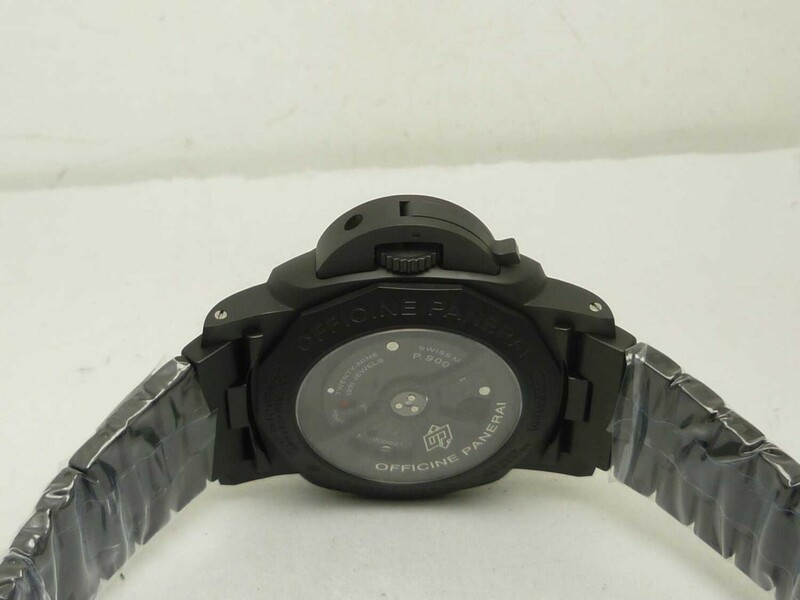 The case is in full black ceramic, look at the lugs and edges of the case, they look smooth, the full ceramic in case and bracelet makes the watch a little heavier than other Luminor Marina watches, it will give you a good feeling when holding on hand. Look at the case, there are two stainless steel screws on the lugs to fix the bracelet to the case. The case side is cushion-shaped and the bezel fits the base tightly. Under the arcd sapphire crystal, it is a matte black dial, like the genuine watch, the replica Panerai Luminor GMT PAM 438 also has a sandwiched dial structure, the disc below is filled with good quality luminous material, which looks a little brownish. The small second is set at 9 o’clock, a small date window featuring black background is positioned at 3, in the center, the canion pin has also been greatly improved so that the hands will not fall off and can run smoothly. There is an extra GMT hand that could be set through the crown. The biggest selling point of this replica Panerai lies in its movement, which has passed through modification and is more stable and accurate than the previous clone P.9000/9001 versions. 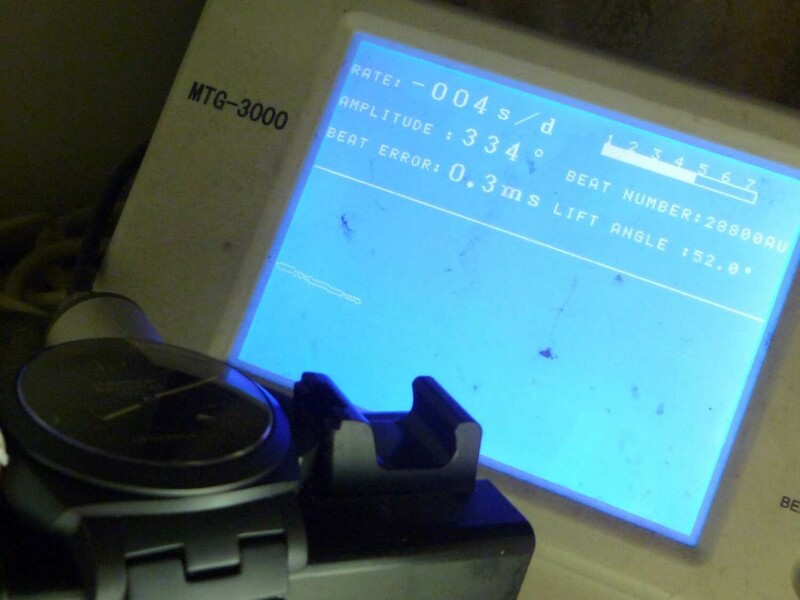 Actually, the movement is modified to the appearance of P.9001 Caliber based on Chinese Seagull ST2555 Automatic. The functions of the movement is like genuine P.9001, which include functional GMT. 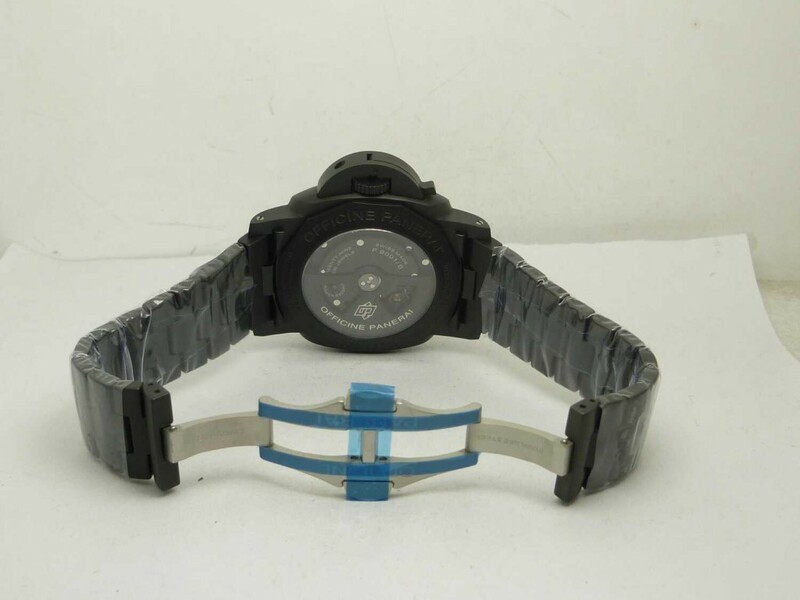 Look at the movement test below, it is only 4 seconds slower per day, with such a low daily error, the replica watch will become a good parter in your daily life. what is the cost of this one? You have access to my email via the form correct? i am still looking to source this watch. if you can email me that would be great! thank you. This week N-factory published the 438. What are your toughts about? After i cecked the pictures of the cal. 9001, zf or kw seems to be in better quality. Is it possible for you to deliver pam 438 made by z-factory? How to buy it in Russia? How can buy to chile? Please let me now price and if the zk kw or noob are best quality. I am looking into the PANERAI LUMINOR GMT PAM 438 CERAMICA CLONE P.9001 MOVEMENT. Could you please email me the details. Dear Karren, cost and purchase please. Thank you! Üdv! Panerai9001ceramica érdekel. Mennyibe kerül és hogyan tudok vásárolni? Köszi! Hi how to purchase this Watch ? And how much is it ? 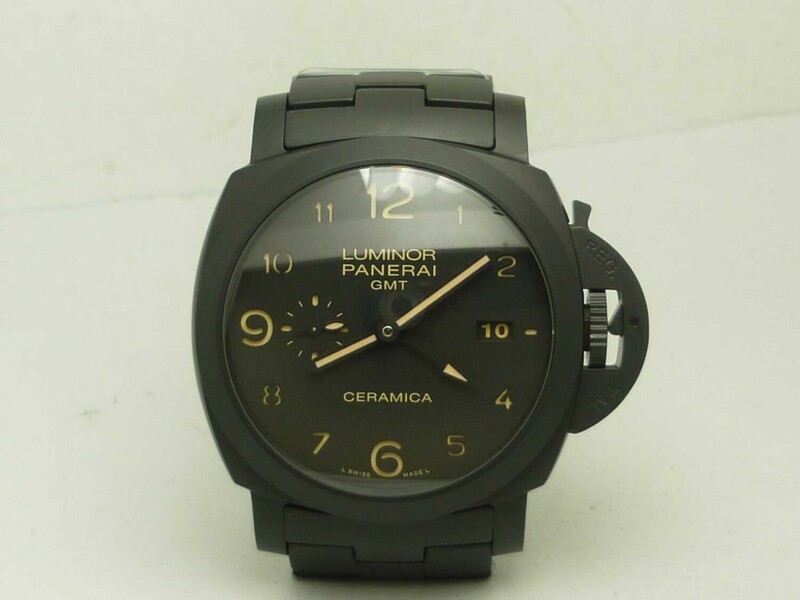 Where can i get a REPLICA PANERAI LUMINOR GMT PAM 438 CERAMICA CLONE P.9001 MOVEMENT? I am interested in purchasing this PAM 438 rep. Located in NYC. Process?